Hot Headz are a relatively young company so it is important that they build their brand. The burned metal and fiery background do the job. Alongside other Crisps brands it stands up very well because nothing looks similar. The inference is that these Crisps will be hot. And that is what they are trying to achieve with the design. It says on the reverse that they are made in the USA, but not by Blair's Death Rain, which it compliments very well. We were a little intimidated by these Crisps. However, for the sake of Chips & Crisps we put ourselves through all sorts of pain. 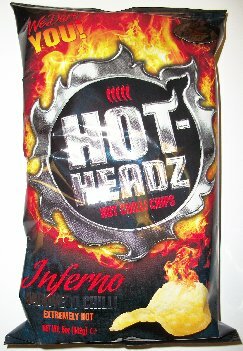 Actually, we don't, but these were one of very few Crisps varieties we have ever come across that have so much heat that they will make some cry. And the crunch cannot be faulted either. A perfectly balanced crispness of hardened oil and seasoning, plus the sustained crash of a stock car smash up. These really did not look much like Crisps. They were thick and bendy, like Hand Cooked Chips. They were of the sort of size and shape of Crisps, but if they were - they were Crisps after an alien invasion of the Deadly Seasoning Planet! There was no potato visible, it was dark reddish brown and glowing orange. It is hard to find Crisps with this much character. The initial taste was a little like sweet barbecue, but then the heat takes over. This is what we wrote for the Blair's Death Rain version of what is a very similar Crisp, "Sweet but smoky, a little like a 1940s private eye's temptress... And then, the heat kicks in... But what's that? Yes, Habanero. There may be a little vinegary, garlic potato, which culminates in a touch of Barbecue, but mostly it was hot! A brilliantly rounded Chip of flavours that hits a home run with the taste description. A pepper's heat is measured on the Scoville scale. A chip's heat is measured on an individual's tolerance levels. At Chips & Crisps we attempt to ignore that and survey whether a Chip does what it says on the bag in a flavourful manner. Yes." We are aware that Blair's do not make Hot Headz Crisps, but they have both pretty much nailed the flavours so well that the rest have to be compared directly to both.